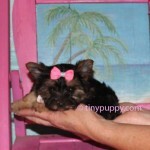 This is micro yorkie Lucy. Lucy is just 19 oz at 9 weeks of age. 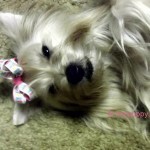 She is a short cobby body girl. She has a very very thick and beautiful coat. Her coat is so thick that she looks big in the pictures. Don’t let that fool you she is tiny and dark. Look at the picture with my hands. 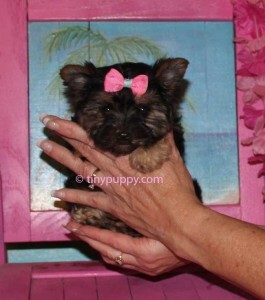 She has a sweet fun and loving personality. 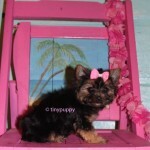 Her Daddy is a Chocolate Tan (Sable) and her Mom is 1/2 Parti Yorkie. Championship Bloodlines yet she is dark. 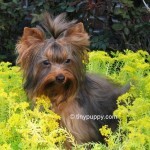 Just goes to show you how the colors of a Yorkie can be passed down from each generation. Just Beautiful.